I want to introduce one of Cloud data management solutions which is “RUBRIK” . Rubrik’s Cloud Data Management platform democratizes public cloud for all enterprises by delivering a modern solution to recover, manage, and secure all data, regardless of location. The power within an enterprise to scale organically and respond to shifting business needs depends on instantaneous access, efficient data delivery, and intelligent data management across the entire organization. Rubrik eliminates the barriers to data mobility, providing mission critical functions needed to drive business agility, cost effectiveness, and performance as enterprises shift workloads to the cloud. 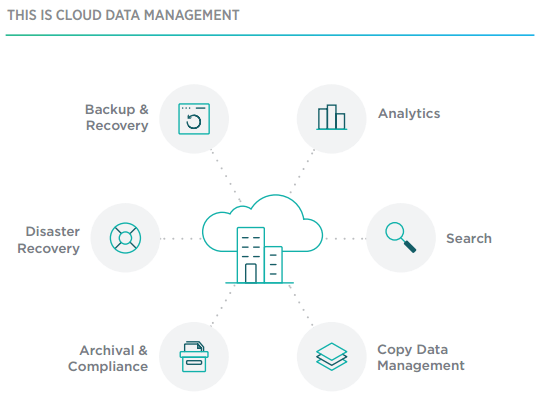 Rubrik Cloud Data Management is a single, software fabric that manages all data in the cloud, at the edge, or on-premises for many use cases including backup, disaster recovery, archival, compliance, analytics, and copy data management. Rubrik Cloud Data Management is a system that distributes data, metadata, and task management across the cluster in order to deliver predictive scalability and eliminate performance bottlenecks. The data management functions as the brains of the system, organizing, removing redundancy, and making data available for search. User interface is built on a RESTful API-driven framework with a HTML5 web user interface that supports virtualization, applications, and public cloud technologies. Users have built end-to-end workflows with Rubrik’s REST APIs to simplify orchestration of daily data management tasks including backup, replication, archival, and recovery. Users commonly use VMware vRealize Orchestrator (vRO) and vRealize Automation to automate delivery of Backup-as-a-Service. These automation workflows enable IT to be easily consumed as a service. Rubrik’s REST APIs plug into configuration management tools, such as Puppet, Chef, Salt, and Ansible. By integrating Rubrik with these orchestration tools, users can simplify deployments of Rubrik across hundreds of servers or VMs. Additionally, when VMs are created on demand, they are automatically associated with a data protection policy (scheduled backups,replication, archival). Rubrik provides an easy entry point into major cloud providers, such as Amazon Web Services (AWS) or Microsoft Azure, with our easy-to-consume APIs. Create custom workflows that quickly move local data to the cloud and intelligently manage data in the cloud according to business needs. Use Rubrik’s built-in reporting capabilities or customize your own reports within third party tools by selecting desired system health monitoring and capacity alerts. Rubrik Cloud Data Management is a disruptive approach to enterprise data management through a simple, run-anywhere platform that spans across clouds. Rubrik brings new value to your data with data management built to drive cost-effectiveness and resiliency combined with cloud-native support to enable business agility. Its innovative technology redefines how enterprises recover, manage, and secure their data, enabling cloud for all enterprises.